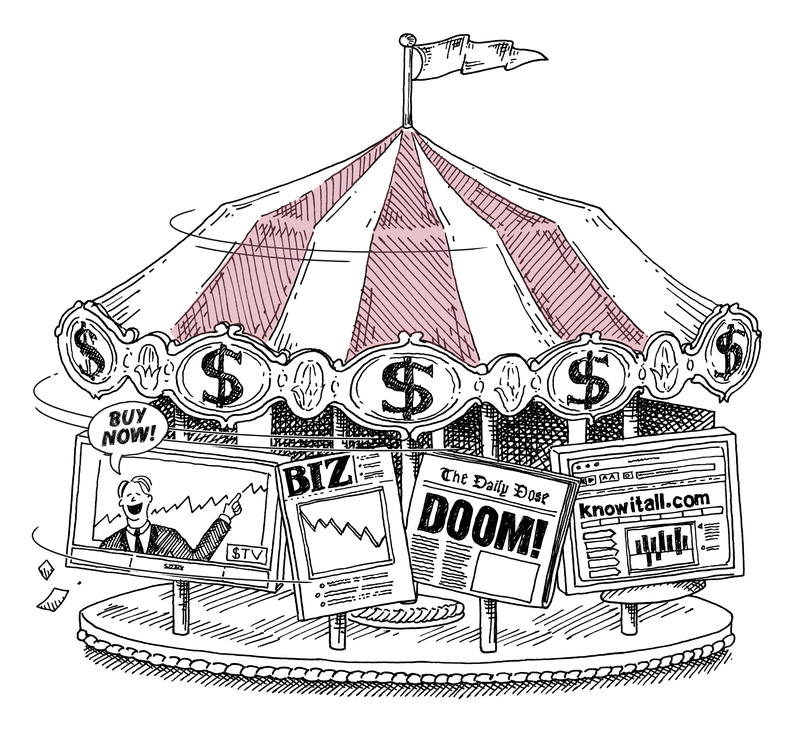 There’s enough investing information being dispensed through the popular media to keep you – and your investment strategy – going around in circles. Herewith, some advice for surviving all the spin plus insights into how McRae gathers information that’s on the square. “Knowledge is power,” said Francis Bacon, the 15th century English philosopher and statesman. And it was a 17th century countryman of Bacon’s, Thomas Henry Huxley, who gave birth to the phrase we hear today, “a little knowledge is a dangerous thing.” In all likelihood, Bacon and Huxley weren’t thinking about investing. But their thoughts sure do apply to it. Knowledge – solid, in-depth knowledge – won’t guarantee good investment performance, but without it whatever investment success one has can be attributed to luck, not skill. And a little knowledge – for instance, the investment tip one sometimes picks up at a cocktail party – is, indeed, a dangerous thing. How many people access investment information is what this Commentary is about. Today, a lot of what people know about investment strategy is what they read, see and hear via the popular media. Their sources range from the business pages of their local newspaper to the highly popular CNBC business network to all manner of business and general interest magazines and websites. Some will delve a little more deeply – reading a book, for example. But, by and large, it’s the media that sets the agenda for what investors think and, very often, how they act and the buy/sell decisions they make. You could call this Commentary a user’s guide to the financial and investment media, specifically what you ought to be aware of as you listen to the all-knowing investment pro being interviewed on CNBC or quoted in The New York Times. We will also share with you how and where we at McRae Capital Management get the information we turn into investment strategy as we manage our clients’ portfolios. • What time period is the person talking about? Is it something he or she believes will happen in the next five days or the next five years? Sometimes people making predictions are purposefully vague about the time frame they are talking about – after all, given enough time just about any prediction will likely come true. • Who said it? A stock analyst? A hedge fund manager? An investment company strategist? An executive of a publicly-traded company? Each has a different perspective and very different motives behind what they say. Some gurus are perennial stock market bulls and you can count on a rosy outlook from them, while others are perma-stock market bears and always see the bottom falling out. • Just because one is quoted in the newspaper or opines during a TV interview doesn’t make him or her an expert. And, it certainly doesn’t make them correct. Many interviews with “authorities” are set up by a public relations firm looking to get visibility for their clients. • Most people agree that the media does tend toward controversy and exaggeration. It’s the old adage that good news doesn’t sell newspapers. If you believe doom is just around the corner you’re more apt to stay glued to your TV. • Among the media’s favorite subjects for interviews are economists. But economics, by its very nature is backward looking – a lagging indicator. They can tell you what happened, but certainly put a lot of hedges around what may happen in the future. • An interview that you will see a lot on TV and read about in business magazines is professional investors picking their favorite stocks. The problem with this – aside from not knowing what is motivating these recommendations – is that they never come back and tell you when to sell. • Finally, remember that people dispensing advice in the media have no responsibility to you. So, they’re wrong. So what? It made for good copy at the time. We don’t work in a vacuum at McRae. Sure, we’re interested in some of what the media is saying. But for us, there are far more important and reliable sources of information and data. We take a selective approach to the media, and we will touch on that momentarily. First, though, we would point out that perhaps the biggest single difference between the way we gather information and the way that most people who follow investing get their information is that we focus first and foremost on individual company data. This is what is known as fundamental analysis – digging into financial and other data to understand what makes a company tick and, hence, which companies are likely to be successful investments. This means analyzing balance sheets, income statements and other financial and operating reports; understanding a company’s markets, products and services, and the competitive advantage they provide; and assessing the quality of management. It’s important not only to follow a company, but also its competitors. And it’s important to understand the larger factors surrounding the industry in which a company participates, i.e., are they favorable for future growth or is this a slowing or highly risky industry? Our “media” include regular filings that companies are required to make with the Securities and Exchange Commission (Form 10-K, for example) and annual and quarterly reports and earnings announcements. We also listen to earnings conference calls and attend annual meetings, which we are frequently able to access via the Internet. In addition, we attend conferences at which executives discuss their companies’ strategy, business plans and products. We find these are particularly useful for understanding companies’ long-term outlook. Some gurus are perennial stock market bulls and you can count on a rosy outlook from them, while others are perma-stock market bears and always see the bottom falling out. In addition to company-specific research, our investment strategy includes following certain “macro” factors, in other words, broad-based economic, political and geopolitical, and policy factors. Typically, monetary policy and tax policy are the two areas to which we pay the most attention. We also study a number of services that provide news, data and analysis. Examples of these providers include Bloomberg, Thomson Street Events, Reuters, Morningstar and Value Line. Readers may be familiar with charts that track the performance of stocks graphically. A service that we have used for some years is provided by Security Research. So, where should investors turn? In all likelihood, you as an individual investor don’t have the time, energy or experience to do fundamental company analysis using a wide range of professional tools. That is, after all, one of the reasons for clients to retain us. That doesn’t mean there aren’t media outlets that can help you keep up with company news and the broader economic picture. Some suggestions follow. We are not advocating that you access all of these media options; which you choose to access and how frequently will depend on your available time. Among magazines, you may want to consider reading Forbes, mainly for its company profiles. We like Forbes because most of the articles are relatively concise and straight to the point. By comparison, a magazine such as Fortune, while well written, has much lengthier articles that don’t offer enough additional insight to warrant the greater time commitment. Among newspapers, The Wall Street Journal usually carries good general business and finance articles. Just reading the news briefs on the front page of the Journal gives one a good, quick overview of general news and news specific to finance and business. If you want more than a snapshot of the news, you can go inside the paper for articles offering greater detail. There was a time when newspapers were the source of news and information to inform investment strategy. Because of their immediacy, TV and radio supplanted newspapers in the fast-breaking news department, and newspapers became more interpretive in their approach to the news. Now, the personal computer, the mobile phone, and the Internet are rewriting the book once again. Depending on your level of computer literacy and your available time, the Internet is an excellent tool offering information in real time. One Web site that is easily accessible and quite useful is Yahoo Finance (http://finance.yahoo.com). If you have enough time, you may want to consider following our practice of visiting company Web sites for information that’s relevant to investors. The CNBC all-business news network has become a media phenomenon that is widely followed. If you watch it, you might want to practice the approach that we use: We find that company executives with earnings reports, announcements about new products or other news usually appear early in the morning or late in the afternoon. That’s the best time to tune in, in our view, because the middle of the day tends to be dominated by investors offering their opinions regarding investment strategy. Another reason for our early/late preference is that companies generally don’t release important news, such as earnings reports, during the day while the markets are open for trading. The practice today is to release news with the potential to move stock prices before the opening bell or after markets close. If you want to delve a little more deeply and read a book, we recommend starting with Peter Lynch’s “One Up on Wall Street.” Lynch is the legendary money manager who, although retired, is held in high esteem for his practical, down-to-earth approach to investing. The book’s subtitle is a clue that it is a comfortable read that doesn’t require specialized knowledge: How to use what you already know to make money in the market. One final cautionary note about the media: Remember that the hardest thing to do is to stay invested when the market gets a case of the jitters. They all jump on the bandwagon and, pretty soon, it seems like the end of the world. If you believe in the stocks in your portfolio, the worst thing you can do is sell when the media is in full panic mode. The other challenge is holding onto a stock when there’s bad news. If the news is transitory in nature, it will pass. Sometimes a brokerage firm will downgrade a perfectly fine performer for the scantiest of reasons and the media will trumpet the call. Of course, if there is a lasting change in a company’s outlook that’s another matter. Looking for that change – a change that could trigger a sell – is why we pore over company data. The same goes for digging deep to find the nuggets of information suggesting that a company is poised for strong secular growth and thus represents an opportune buy. We have no problem with the media. We just feel individual investors need to recognize the difference between entertainment and enlightenment. So, read the newspaper and watch TV and browse the Internet. Just don’t bet your portfolio on what you read and hear every day. McRae Capital can help you understand a host of topics, like the risks of market volatility, how to live off retirement savings, and why taking the long view as an investor is so very important.